​The Grapevine Springs, which flow into the Elm Fork of the Trinity River, have attracted visitors for more than 2,000 years. In 1843, Republic of Texas President Sam Houston camped here during treaty negotiations with Native Americans. The treaty was later signed at Bird’s Fort. In 1936, Dallas County accepted the donation of Houston’s campsite as park land and the Federal Works Progress Administration (WPA) built rock walls, picnic facilities, foot bridges and other features. During World War II, ownership reverted to prior owners. The Baptist Foundation of Texas later obtained the land and donated it to the county in 1991. Today, the City of Coppell maintains it, and efforts to restore WPA features are ongoing. Kentucky native Washington Curtis Bullock (1821-1889) married Caroline Hunsaker in 1844. The Bullocks lived in Missouri and in 1855 they came to Texas with their four children. In 1866 the bullocks purchased 280 acres here from former Peters colonist Seborn J. Baggett. The last of the Bullock’s nine children, Julia Caroline, died at the age of three. This cemetery began with her burial at this site in 1869. The Bullock family built a two-story brick home and operated a farm. W.C. Bullock established a rural school for his children and those of his neighbors and also served as Justice of the Peace. He died in 1889 and was buried here. Caroline Bullock was buried here in 1899. The bullocks’ heirs sold the reminder of the original acreage to J.R. Powers in 1902 and set aside the cemetery in the transaction. Location: Outside the entrance to the Bullock Cemetery off Washington Court. 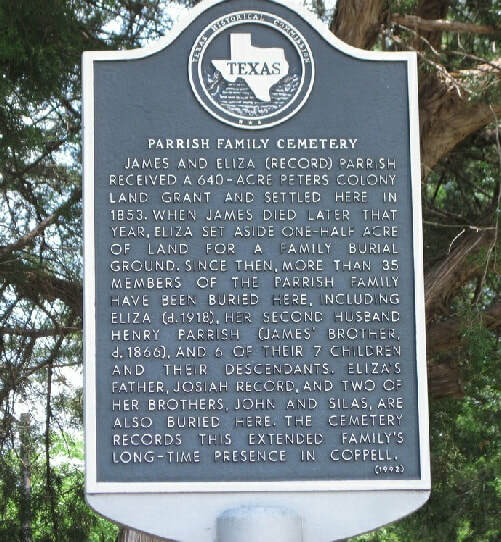 James Parrish came to Texas from Ohio prior to 1844 as a member of the Peters Colony. He and his wife Eliza Jane (Record) moved to Dallas County about 1848. They established a home in this area on the Elm Fork of the Trinity River which became known as the Parrish neighborhood. Sometime before James Parrish's death in October 1853, he and his wife set aside land on their farm for a community cemetery. Joshua Hill was buried here in 1859, the apparent victim of smallpox. More interments occurred in the following decades, including those of James Pinson Howell (1865), John L. Howell (1866), and Malinda Pemberton Howell (ca. 1871). Also believed to be buried here are five men and a boy who were victims of a lynching in 1869; several Confederate veterans of the Civil War; and two former slaves. 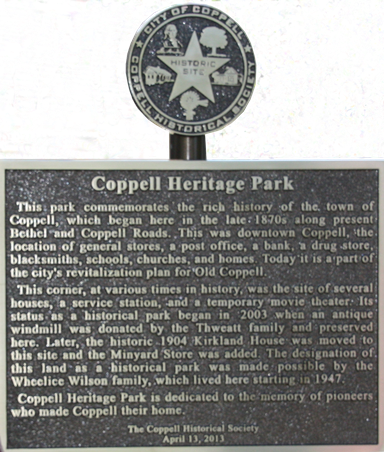 This Park commemorates the rich history of the town of Coppell, which began here in the late 1870s along present Bethel and Coppell Roads. This was downtown Coppell, the location of general stores, a post office, a bank, a drug store, blacksmiths, schools, churches, and homes. 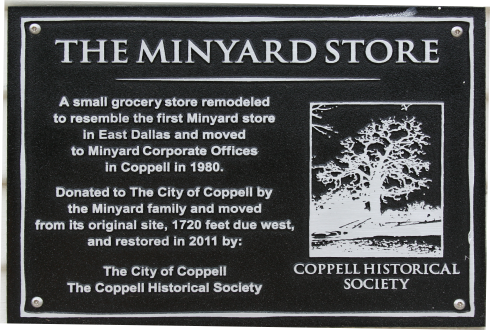 Today if is a part of the city’s revitalization plan of Old Coppell. This corner, at various times in history, as the site of several houses, a service station, and a temporary movie theater. Its status as a historical park began in 2003 when an antique windmill as donated by the Thweatt family and preserved here. Later, the historic 1904 Kirkland House was moved to this site and the Minyard Store as added. The designation of this land as a historical park was made possible by the Wheelice Wilson family, which lived here starting in 1947. 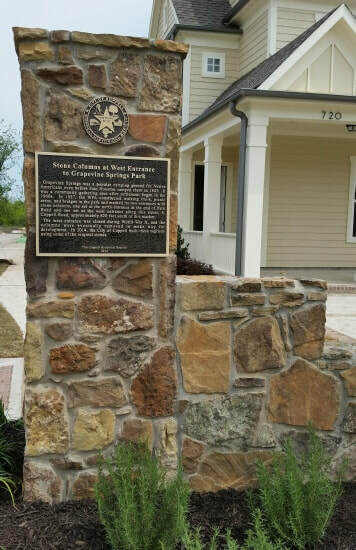 Coppell Heritage Park is dedicated to the memory of pioneers who made Coppell their home. 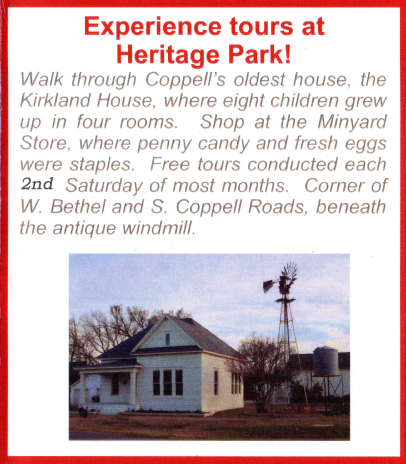 Location: Heritage Park at the southwest corner of Bethel Road and South Coppell Road. In 1928, three county schools - Gentry, Bethel, and Coppell - consolidated, and a new brick building was constructed on this site. Known for almost four decades as Coppell Grade School, it housed grades one through eight in seven rooms. The building burned from unknown causes in 1949, and students had to attend classes in Carrollton until reconstruction could be completed. The second building looked almost exactly the same, since it was rebuilt using the original concrete foundation and brick walls. Shortly after 1959, when the Coppell Independent School District was created, an additional building was added to the east side, and one grade was added per year until Coppell had its first complete high school m 1965. Two years later, the upper grades moved to a new campus, now Coppell Middle School West. This building then became known as Coppell Elementary School. When a second elementary school was constructed, this building was renamed Pinkerton Elementary, in honor of the school district's first superintendent, W. W. Pinkerton. Location: Attached to the current Pinkerton Elementary School on Southwestern Blvd. In 1843, Sam Houston, President of the Republic of Texas, and fellow travelers camped under this and other oak trees at these springs and met with local Indian tribes, attempting to negotiate a peace treaty. The treaty, signed several months later, promoted settlement and trade throughout the area. Location: Attached to a bolder at the foot of the large oak tree. 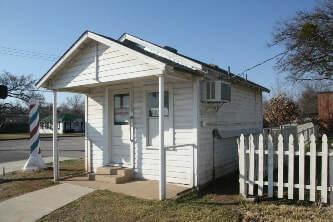 This building was Coppell's first fire station, built by J. T, Maynard in 1958. A siren beside it would sound when someone called the department's phone number. Anyone around at the time would hurry to answer the phone while the town's volunteer fire department members assembled. The building's one bay was later expanded to two, then to three. 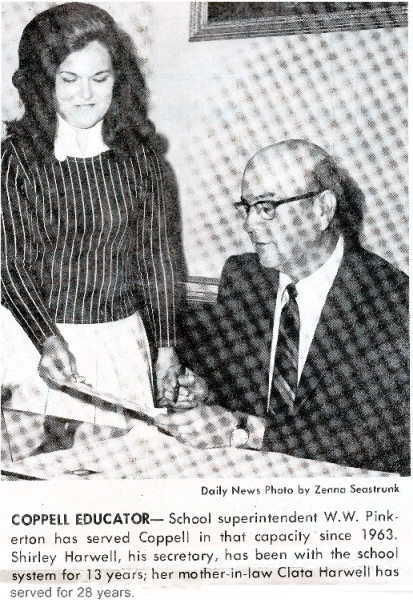 the City Council started meeting in the school cafeteria, and Gentry and R. M. Johnson, Coppell's first mayor, shared offices in the building. 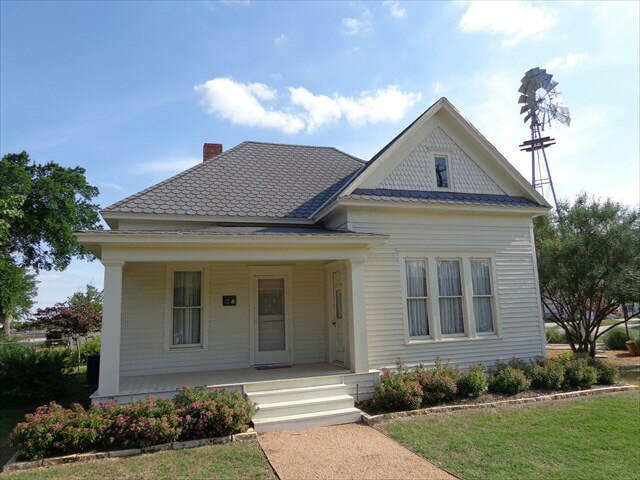 It was later expanded by volunteers to include two jail cells and became the home of the Coppell Police Department. 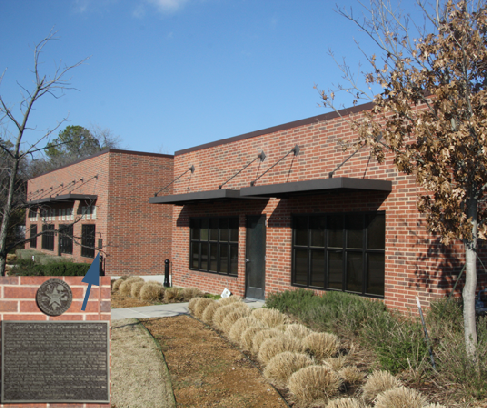 In 1972, a third building was added behind the other two that served as the city permit office and as the office of George Campbell, Coppell's first city manager. In 2012, the property was purchased and renovated to house the offices of Amcat Adjusting Services. Location: Attached to the Amcat Adjusting Services building at 616 S. Coppell Road. The building on the right was a small house - formerly used as a telephone operator's office - when Floyd and Clayta Harwell bought it in 1932. They expanded it and added a large room on the west side which served as Floyd's Barbershop. In 1956, Floyd purchased the comer lot on the left, where a service station had been located, and he moved in the small building to serve as his barbershop. 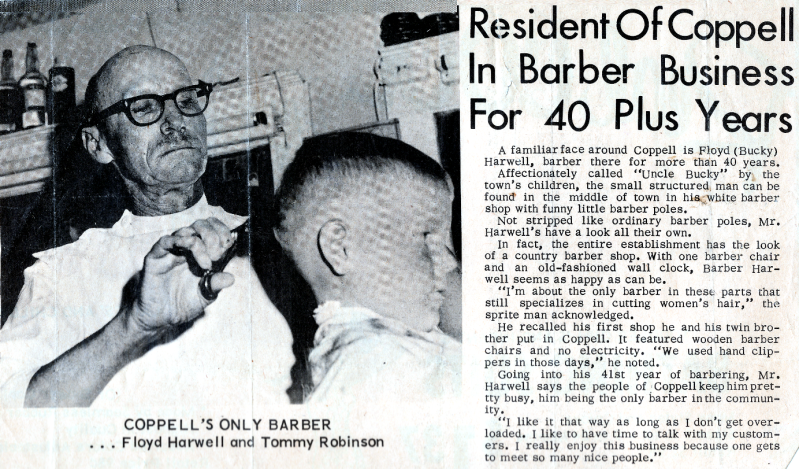 Floyd Harwell was Coppell's barber for over four decades and also acted as a volunteer umpire for Coppell's baseball team in the 1940s. 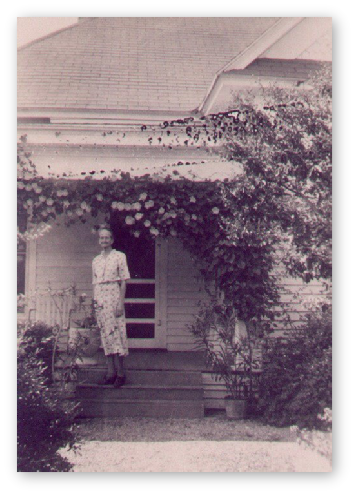 Clayta Harwell, station manager for Coppell's railroad depot, also served as cafeteria supervisor at Coppell School in the 1940s and 1950s. The land for this park was donated to Dallas County by the A. Webb Roberts trust on October 31, 1991, to be set aside and used for Grapevine Springs Park. A. Webb Roberts came to Texas from Ballground, Georgia in 1919. His vision led him to purchase hundreds of acres of land in key locations, including some in the area where the Dallas/Fort Worth International Airport is now situated. Mr. Roberts used his resources to benefit charitable causes in the Dallas/Fort Worth Metroplex. He made a significant contribution to the Baylor Health Care System of its A. Webb Roberts Hospital. 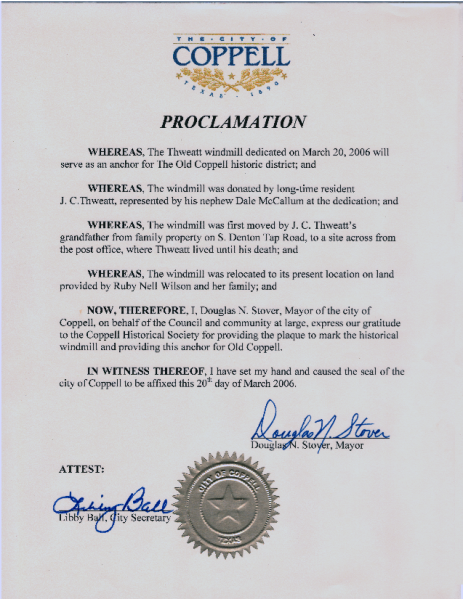 His love for North Texas is visible through his many acts of generosity, and it was his desire that this beautiful park be a place of quiet reflection. Location: Inside the Grapevine Springs Park off Park Road. Location: Attached to the front of the Kirkland House in Heritage Park. Location: Attached to the front of the Minyard Store in Heritage Park. Windmill from the Thweatt Farm. 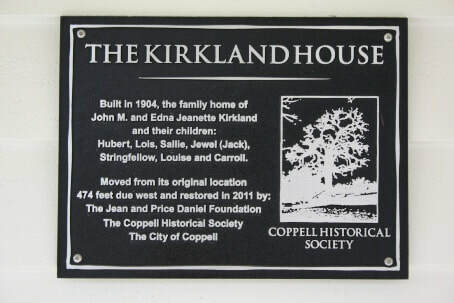 Now located at Kirkland House in Coppell Heritage Park on S. Denton Tap Road. ​Location: Attached to a rock at the base the windmill in Heritage Park. two of her brothers, John and Silas, are also buried here. The cemetery records this extended family's long­time presence in Coppell. Two identical wood frame buildings were located on this corner: Bethel Freewill Baptist Church on the right and Bethel School on the left, both buildings facing east. The one-room buildings were built in the 1890s. Bethel School served farming families in the area. Some local residents who taught in the school were Sallie Kirkland Brooks, W.L. Gregory, J. Clyde Drury, and Pleas Corbin. 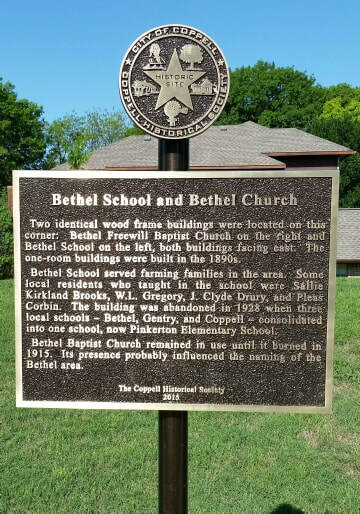 The building was abandoned in 1928 when three local schools — Bethel, Gentry, and Coppell — consolidated into one school, now Pinkerton Elementary School. Location: On the west side of Moore Rd. and approximately 100 feet south of Bethel Rd. 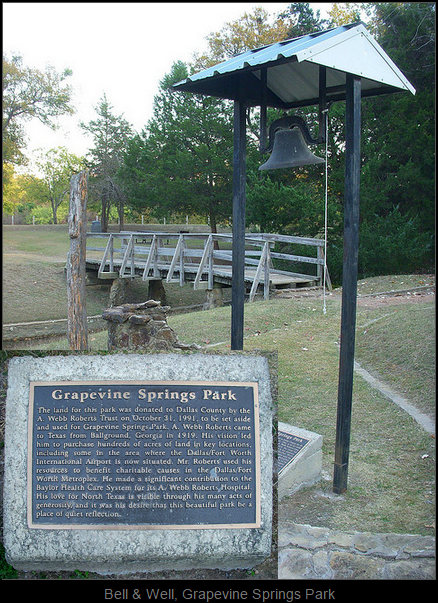 Grapevine Springs was a popular camping ground for Native Americans even before Sam Houston camped there in 1843. It was a community gathering spot after settlement began in the 1860s. In 1937, the WPA constructed walking trails, picnic areas, and bridges in the park and marked its two entrances with stone columns, one set at the north entrance at the end of Park Road and one set at the west entrance along this street, S. Coppell Road, approximately 620 feet south of this marker. development. In 2014, the City of Coppell built these replicas using some of the original stones. 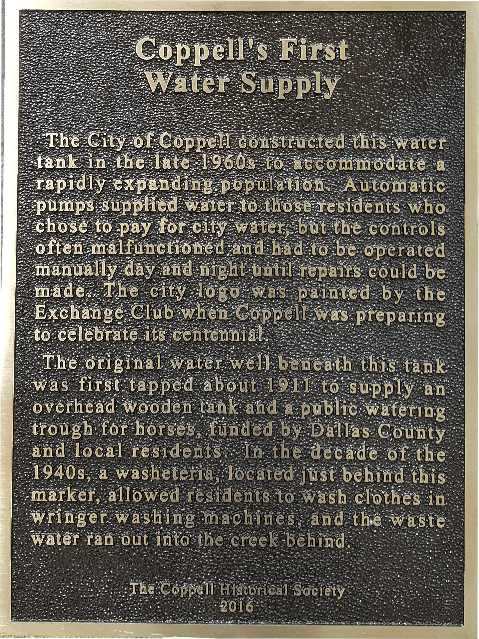 The City of Coppell constructed this water tank in the late 1960s to accommodate a rapidly expanding population. Automatic pumps supplied water to those residents who chose to pay for the city water, but the controls often malfunctioned and had operated maunally day and night until repairs could be made. The city logo was painted by the Exchange Club when Coppell was preparing to celebrate its centennial. The original water well beneath this tank was tapped about 1911 to supply an overhead wooden tank and a public watering trough for horses, funded by Dallas County and local residents. In the decade of the 1940s, a washeteria, located just behind this marker, allowed residents to wash clothes in wringer washing machines and the waste water ran out into the creek behind. Location: Bethel Road, near the actual water tank. ​The St. Louis Southwestern Railway opened its new line through Gibbs, Texas, in 1888. 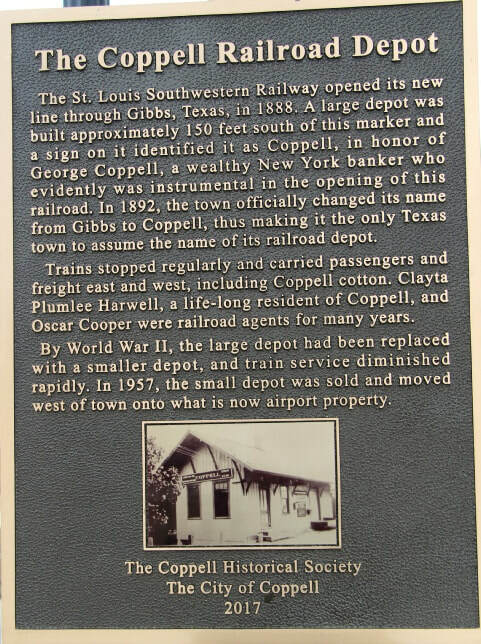 A large depot was built approximately 150 feed south of this marker and a sign on it identified it as Coppell, in honor of George Coppell, a wealthy New York banker who evidently was instrumental in the opening of this railroad. In 1892, the town officially changed its name from Gibbs to Coppell, thus making it the only Texas town to assume the name of its railroad depot. Trains stopped regularly and carried passengers and freight: east and west, including Coppell cotton. Clayta Plumlee Harwell, a life-long resident of Coppell, and Oscar Cooper were railroad agents for many years. By World War II, the large deport had been replaced with a smaller depot, and train service diminished rapidly. In 1957, the small depot was sold and moved west of town onto what is now airport property. Location: S Coppell Rd in front of Life Safety Park replicate of the train depot. In an effort to attract settlers to the region and to provide protection from Indian raids, Gen. Edward H. Tarrant of the Republic of Texas authorized Jonathan Bird to establish a settlement and military post in the area. Bird's Fort, built near a crescent-shaped lake one mile east in 1841, was the first attempt at Anglo-American colonization in present Tarrant County. The settlers, from the Red River area, suffered from hunger and Indian problems and soon returned home or joined other settlements. In August 1843, troops of the Jacob Snively expedition disbanded at the abandoned fort, which consisted of a few log structures. Organized to capture Mexican gold wagons on the Santa Fe Trail in retaliation for raids of San Antonio, the outfit had been disarmed by United States forces. Location: West of FM 157, inside Arlington's River Legacy Park.